Is this an early Andy Warhol pop art sketch? One of the more interesting stories this week told of the Devon man, Andy Fields, who spent £3 on a sketch at a garage sale in Las Vegas, only to be told when he returned home that it could be a genuine drawing created by the renowned pop artist Andy Warhol when he was a young child – aged 10 or 11. One expert is convinced, but not everyone is. 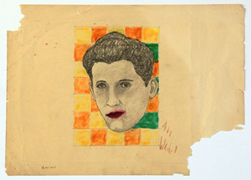 Crucially, the Warhol Authentification Board (yes, there is such a thing) have been unable to authenticate the sketch as there is doubt as to whether it might be genuine. The pencil and graphite drawing was created in the 1930’s and experts believe that (if it is genuine) it could be worth a minimum of £1.25 million, but if a bidding war erupts it could fetch over ten times that amount. So, exciting times for Mr Fields. And how does he sell this drawing? Unbelievably, he has chosen eBay. Perhaps he has done this because he cannot prove it is genuine and hence none of the auction houses will take it. I am willing to bet he was left more than a little disappointed when the Warhol Authentification Board refused to authenticate the drawing. Had they done so, he would have been sitting on a gold mine. One of the reasons the Board were not that taken by the drawing was the fact that it had been signed “Andy Warhol”. However, Warhol changed to his name to “Andy Warhol” from “Andrew Warhola” in 1949, so you might wonder why he signed it “Andy Warhol” in the 1930s. A simple explanation, claims Fields. He states that Warhol never signed the work at the time, but did so many years later when he gave it away and was asked (as you would) to sign it. At the time of writing, the piece is up for sale on eBay with a starting bid of £1.25 million. I don’y know about you, but no matter what I am selling on eBay I can get a little excited, even if I am trying to get rid of a chest of drawers or something. If I had this piece up for auction I doubt I’d sleep for a week. Of course, you can’t rule out the crazy bidders and if Fields does sell this to a genuine person paying a genuine sum of money then I would be surprised. I am sure eBay are rubbing their hands with glee and hope that someone out there with more money than he knows what to do with takes a big chance and buys the sketch, knowing that it may not be genuine at all. I wonder how much the eBay fees would be? Pity the Las Vegas garage seller, whoever he is, and whether he knows anything about the drawing he sold that could turn Fields into a millionaire.